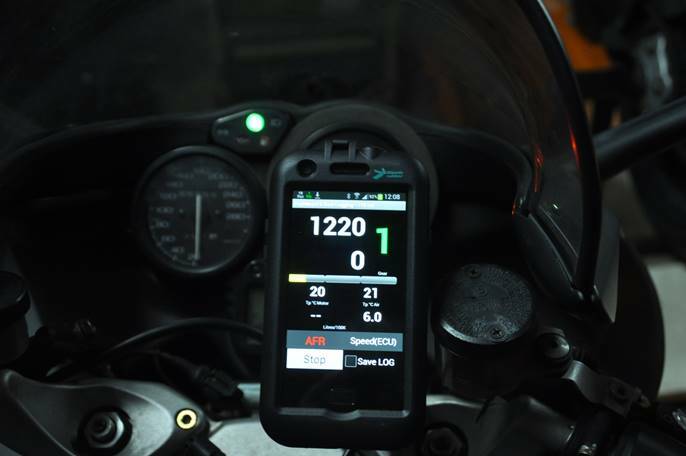 Diagnose and Data logger Marelli 59 and M5A for Ducati, Guzzi, Morini, MV. It’s a TOOL, not a dashboard. - to carry out procedures of “active” diagnoses. 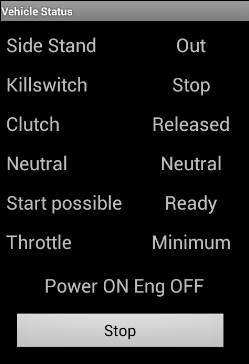 It requires an electronic interface between the Android Smart Phone and the ECU. 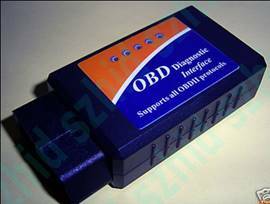 It needs ELM327 Bluetooth and Fiat OBD-3pins connexion. ScanM5X manages the 59 and 5A same manner. - measurements of the Lambda Sensor. 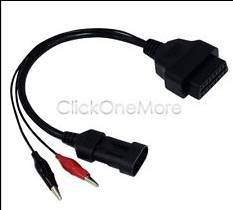 It seems that all the models equipped with the same ECU are compatible, but nothing is worth a confirmation by a test. 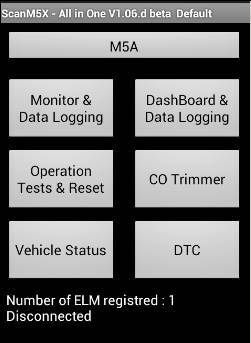 It does not replace the diagnostic tools of the manufacturers because those contain accessories making it possible to carry out more sophisticated analyses of breakdown. And especially it cannot replace either the expert testimony of the mechanics of the networks. I decline any responsibility as for the consequences for his use. Lors de la première utilisation, ScanM5X recherche les accessoires BT à proximité et propose une liste de choix. Si ELM327 est bien alimenté, il le détecte et vous devez le sélectionner. Mettre le contact de la moto car la procédure de connexion commence immédiatement. Si la connexion avec ELM327 est correcte, ScanM5X enregistre le Id de ELM327. Ainsi les fois suivante ScanM5X sélectionnera automatiquement ce device. Le fichier des ELM déjà utilisés se nomme ScanELM.txt et se trouve sur la carte SD de votre smart Phone. Il peut être modifié manuellement en ajoutant ou supprimant un Id. Si il y a un seul enregistrement, ScanM5X se connecte directement à cet Id. S’il y en a plusieurs il se connecte à celui qui est découvert. Pour gérer les cas de multiples Id ELM, le menu « Registre your ELM » du Main Screen permet de changer ou d’ajouter d’autres Id. Sur certains types de téléphones, la découverte peut échouer. Utiliser le menu « Registre your ELM » pour sélectionner manuellement votre ELM. During the first use, ScanM5X seeks the BT accessories in the vicinity and proposes a list of choice. If ELM327 is well fed, it detects it and you must select it. 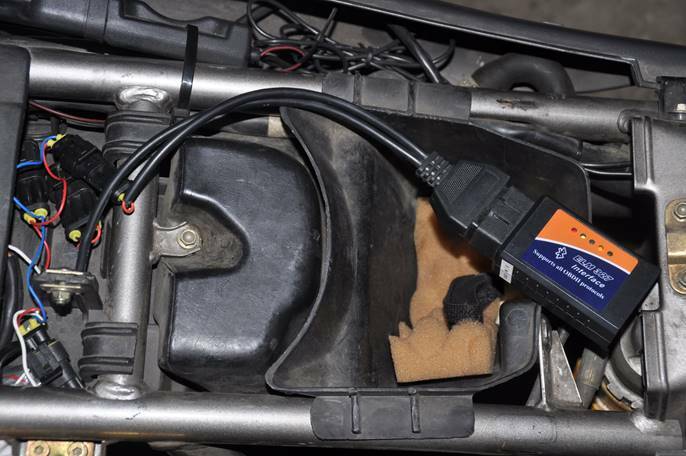 To switch on of the motor bike because the procedure of connection immediately starts. Caution: connection is blocked by the ECU if the latency KEY ONE is too long (10sec). ELM327 maintains connection even if ScanM5X is stopped. If connection with ELM327 is correct, ScanM5X records the Id of ELM327. Thus the following times ScanM5X will select this device automatically. 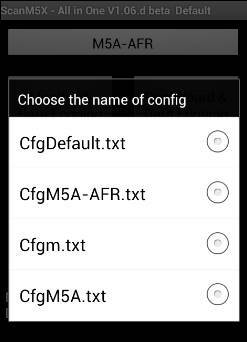 The file of the ELM already used names ScanELM.txt and is on the internal SD (/scanM5X folder) of your smart Phone. It can be changed manually by adding or removing an Id. If there is a single record, ScanM5X connects directly to the Id. If there are more it connects to that discovered. To handle cases of multiple Id ELM, the 'Register your ELM "Main in Menu Screen allows you to change or add more Id. Certain types of phones, the discovery may fail. Use the 'Register your ELM "menu to manually select your ELM. To change the configuration setting, touch the button on the top (M5A-AFR). See “Setting” to know how to create a new one. When ScanM5X is connected with ECU via ELM, the type of your ECU is show. Now you can choose one function. ScanM5X discovers all active devices around, connect and stores the ELM Id for the next use. But it does not work with some phones. I added a procedure to select manually the ELM BT paired, bypassing the discovery problem. Change ELM: Clear the old ScanELM.txt file, store the selected ELM Id. If there is only ONE Id in the ScanELM.txt, ScanM5X will connect directly with this device, without discovery. Add New ELM: If you have multiple ELM, you can add more Id, but ScanM5X will initiate the discovery process to connect to the one in use. Don’t use if your discovery failed with your phone. 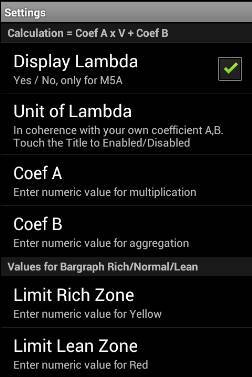 In the stting you set the coef A and B to display and save the Lambda in mV (A=1 B=0), AFR or Lambda. You can log data with the Speed. If the AFR is enabled, the progress bar displays the value. You can set the limit of Rich and Lean. During the learning phase, the background is gray. To acquire, keep the same ratio until that is recognized, from the first to the 6th. It is imperative to respect the ascending order. When all speeds are known, hit the report (number green)t, this will close the learning phase and record the values ​​in the setting. They are saved in Config file. You can choose the units. Consumption = Fuel / Distance * 100 or Distance / Fuel with the good units. You can reset the average consumption with a function in Menu. You can reset the indicator of service. You can reset your TPS. The motor must be OFF. It useful when the bike does not start at the edge of the road, is lived. 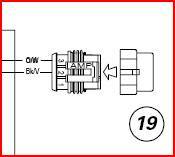 You can change the trimmer, but it is useful only if your motor is not in regulation CO in closed loop (M59). If you change the value but not save, the old value will be use next Key ON. The name appears at the top of the main page. To change, touch the name and the list of configurations appears. Select. All changes made ​​are then stored in the active config. You can manually change in editor. Do not change the name of the fields. Configurations are recognized by the prefix Cfg, do not delete it. The CfgDefault.txt is essential and may not be erased, but you can change values. 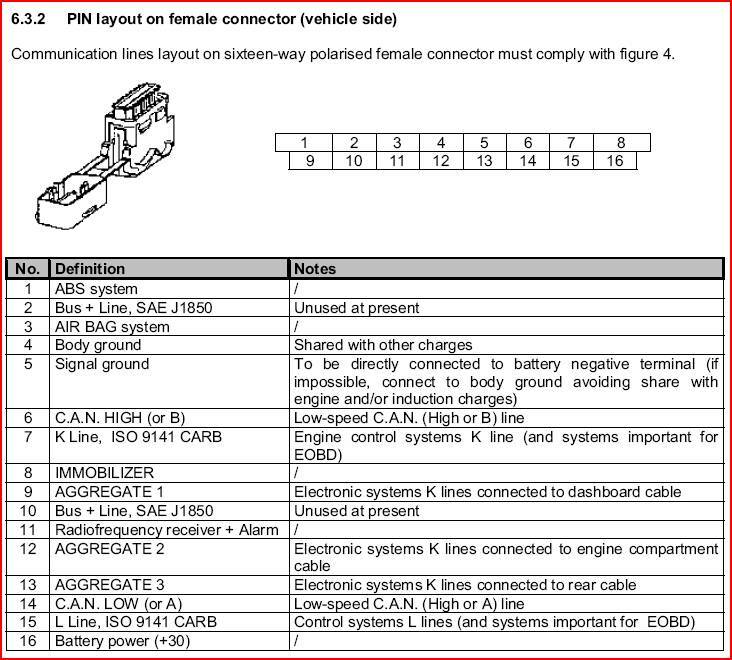 Connected with ELM327 not with ECU : Turn Key OFF/ON, the ignition must be ON < 10sec., check your wires, try Menu/Connect again. 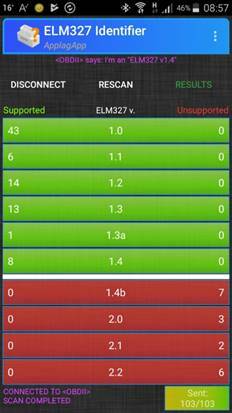 Download “ELM327 Terminal” on Google Play, it’s free. è Turn Key OFF/ON, the ignition must be ON < 10sec., check your wires.